This THP is north of the Ishi Wilderness Area about 8 miles SW of the town of Mineral, CA and about 25 miles east of Red Bluff. 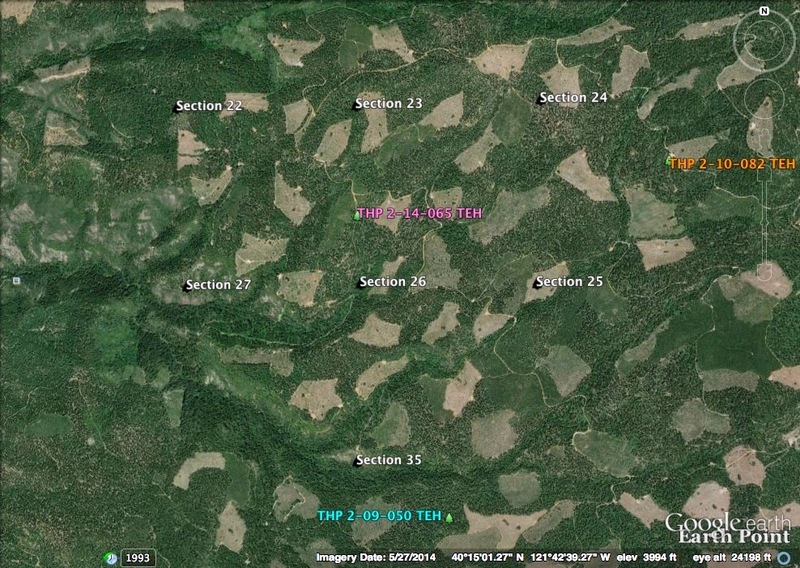 Sierra Pacific Industries is planning a clearcut tractor logging operation in ponderosa pine, sugar pine, white fir, Douglas fir and incense cedar forests at an elevation of 3,750 to 4,320 feet. 23 road drainage sites are planned for work including rocking, dip construction and culvert repair and replacement. So called temporary "jump roads" will be created to connect clearcut units with haul roads. There are 2 goshawk territories within 1.5 mi in sections 2 and 15, and a 1924 sighting of a silver haired bat was recorded within .5 mi of the THP area in section 35. More information is available on the THP Tracking Center website.